Overall, the body of the Inscription is aerodynamic. Modest curves and sculpted lines redirect the flow of air as you drive through Ann Arbor. Chrome trim is used throughout. You can find it around the side mirrors. It's also used heavily on the front-end. It covers the grille bars as well as the outer grille trim. 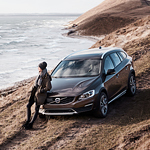 On the back of the V60 Inscription, there are many great design details. First, the wagon has two integrated exhaust pipes. They're surrounded by mirror chrome and blend in seamlessly with the vehicle's profile. Another notable feature is the taillight design. A long ribbon of light is used to create a dramatic abstract shape. It starts on the liftgate and rises up next to the rear windshield.